Simply put, an epoxy floor coating will make your garage flooring look fantastic. But it takes forever to install one, right? Wrong. 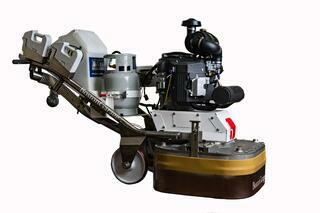 Thanks to Boston Garage's new grinding machine, your garage flooring can be prepped much more quickly than before. That means significantly less downtime for you. You'll be back in business in no time. 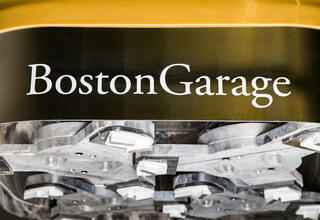 The machine purchased by Boston Garage is one of the largest on the market today. As such, it significantly increases Boston Garage's installation capacity and allows us to make even more customers happy with the look and performance of their garage flooring. With the new machine, our installation crews can prepare 1,200 square feet of flooring in an hour. This means that we now have the capacity to complete larger commercial projects and industrial jobs much more efficiently than ever before. The new grinder was handcrafted to Boston Garage's specifications and shipped directly to our offices. With it, our installation crews stand ready to make your garage flooring shiny, durable and easy to maintain. Why is prep work important during installation? The prep work is arguably the most important aspect of installing epoxy floor coating. Without proper prep work, the epoxy may not bond adequately to your garage flooring. To ensure the epoxy adheres fully and smoothly, the surface needs to be clean, dry and free of dust. Our professional installers will make certain the epoxy has the ideal surface to bond, and our new grinder makes the job much easier. The result is a better looking floor that lasts longer. Can I install epoxy floor coating myself? 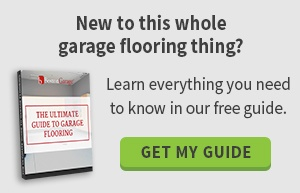 True, there are kits at your local Home Depot that will coat your garage flooring. But without adequate prep work, there's a good chance a coating like this won't make it through the year. Our professional installation team will sufficiently prep your floor and expertly apply the epoxy coating. Then, after it has time to dry, the floors will be attractive, durable and will stay looking great for years to come. Without the extra time we take to clean and prepare your garage floor, the epoxy coating simply won't last and your investment will be all for naught. Want to learn about our new equipment? Give us a call today to talk about how Boston Garage can quickly install a new epoxy floor coating in your garage with expert results. Contact us by phone at 781.836.5145 or use our online form to submit your questions or request a quote.